These men were symbolic of the one to come, the Branch, the Lord Jesus Himself. There was Glory in the things that Jesus said and did and he also left us a pattern for his newly birthed church. There was Glory in His Word as well, waiting to be discovered. This is later reflection upon what the Lord had given me. Initially, I was too overwhelmed to even pen what I had seen. The hand of the Lord is heavy upon me now to recount the revelation of what he had given me four years previously. He said that I would now write this account in His Presence. ​I saw a chair in the corner in front of the floor lamp with a marble topped pedestal beside it. I then saw a short sculpted pedestal of which I had planned to put a vase with flowers. I painted it a cream base with gold accents on the sculpted carvings and it would sit in front of the ivory covered pole. I did not see many chairs in this place maybe one or two other chairs, as it was a very small room. Beside this final station, I saw a doorway. I squared off its dimensions with gold fabric and lined the outer edges with the same ivory material used in the room. Behind this doorway was the platform itself. In front of this doorway, I saw two golden pillars which had two large angel candleholders set a little bit from the wall. 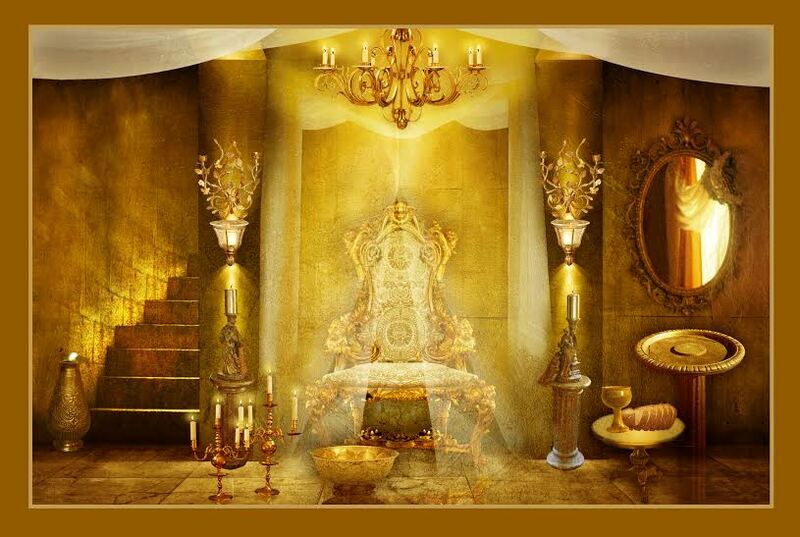 The candelabra and golden bowl were positioned in front of the angels. These prophetically represented the cherubim that covered the mercy seat and the worship angels in Heaven. The vision went on to include two white pillars that framed this doorway and above the doorway was a valance that jutted out two feet from the wall and was fashioned as a throne. Hanging on the sides of the valance and parted in front was soft ivory tulle that could be seen through but represented the veil that was rent in two and opened for us. The veil was slightly parted though one had to press through to come into this inner sanctum with Him, the very Throne Room of Heaven. And behind this ivory tulle, was to be a picture of the Lord with his arms opened for us inviting us in to meet with him. This picture was to be a canvass rolled up as a scroll with two rods holding it up from its north and south borders. This picture was commissioned but never hung on the wall, nor was the Throne Valance finished to its completion. ​The teachings of the Heavenly Worship Room were published in Chapter 7 “Entering the Holy of Holies” of “Lessons from One Worship Leader to Another” in June 2007 and the “Unlocking Worship Teaching Series” in February 2008. One final revelation about this room came three weeks prior to our first ministry trip to South Africa in November 2008. The Lord quickened me that we were currently in the Jewish festival season of the Feast of Tabernacles, (also Feast of Booths or Feast of Sukkot) from October 14th-22nd of 2008. He quickened me to go and see when the Feast of Tabernacles was in the year of 2004. The Feast of Tabernacles in 2004 was between September 30th and October 8th. It was during this time that I began to receive the revelation of the Heavenly Worship Room, which was a Feast of three tabernacles, the Mosaic, the Davidic, and the New Testament Tabernacle of Jesus Christ.